Published in the Dover Express, 20 March, 1981. Buckland Bottom is the old name of that wide hollow which lies between Chapel Mount and Bunker’s Hill, up which at the present time runs Union Road and St Radigund's Road. When this book was written, in 1906, there were still living old inhabitants of Buckland who remembered when there was not a single human habitation in this hollow, with the exception of Coombe Farm, which stood to one side, and some could recall the time, eighty years before, when Dover races were held in Buckland Bottom. There has been, from ancient times, a road running up this vale to Poulton, Coombe, and St Radigund’s Abbey; but the Coombe Valley Road (formerly Union Road' opening is quite modern, dating from the time when the Union Workhouse was built there in 1835. At the beginning of 1834, the estate of the then deceased Mr William Kingsford, the elder, was being disposed of, and his property on the west side of the London Road is particularly described as extending from Bartholomew Terrace up to a 40ft. wide plot adjoining Buckland Brewery, which was intended to form an opening into Buckland Bottom.“ That definitely fixes the date of the origin of Union Road. The whole of the roadside land, from the brewery wall down to below where the old Wesleyan chapel was subsequently built, was put on the market as building land by Mr Charles Lamb, auctioneer, in February, 1834. He, however, failed to dispose of it, and a month later there was a much fuller announcement of the intended sale of Mr William Kingsford’s land on the south side of Buckland Bottom, comprising over 130 acres, in 31 lots. From the description it appeared that from the brewery wall down to Erith Place was a farmhouse and farmyard, which was then very ancient. The farmhouse, occupied by Mr Finn, the steward, stood just where the Fountain Inn now is, and on a part of the site of Swiss Cottages there was a farm labourer's cottage, and close to it, fronting the main road, was a large barn, which was at that time demolished. There were other farm buildings in the rear, surviving well into the 20th century, having their approach from Union Road. The 130 acres of land then sold comprised the part known as Chapel Mount, so named after the old lepers' chapel. The other land was that later occupied by George Street, Erith Street and Victoria Street, and also extending up the south side of the valley as far as the boundary of Poulton. At the back of the farm there was a brickfield, then carried on by Mr John Finnis, some remains of which used to be seen in front of Edgar Road, but it has mostly been covered by the railway. A large part of the land in Buckland Bottom, including the farmyard, was purchased by Mr George Hatton Loud. The farmyard subsequently became an attractive garden owned by a Miss Loud. The Dover Union Workhouse was the first building in Buckland Bottom. The minutes of the Dover Union, as recorded by the clerk Mr William- Cross give ample details of the building of that structure. On Thursday, July 16th, 1835, a meeting of the new River Union Building Committee took place at Buckland Bottom, when the site of the new Union Workhouse was selected. It was agreed that it should stand well isolated from all other buildings, facing the road (St Radigund’s) leading to Coombe Farm; and as soon as that decision was made, upwards of fifty labourers, belonging to the different parishes, who had assembled, furnished with picks, shovels and wheelbarrows, were immediately set to work to excavate and level the ground in preparation for the building operations. When the Dover Union was formed, under the powers of the Poor Law Amendment Act of 1834. there were three Poorhouses in the district covered by this union — one at River, with which were connected the greater number of the parishes; one at Martin, with which were associated some parishes now in Dover Union, and some in Eastry Union; and one at Catherine's Place, Charlton, built specially for the poor of St Mary's parish. These three houses were superseded by the new building in Buckland Bottom; and, although the new combination of parishes was at first called the new River Union, the name soon changed to the Dover Union. The original Buckland Bottom Workhouse, as a building, is not of historical importance. It was designed on the plan approved by Sir Francis Head, the then all-powerful Poor Law Commissioner, in the form of a quadrangle, as like a prison and as unlike the cottage homes to which the paupers had been accustomed, as possible. The erection and fitting up of the house ready for the reception of its inmates occupied nine months and a week from the time the land was commenced to be levelled, on the 14th July, 1835, until the inmates were removed from the River to the Buckland Workhouse, on the 22nd April, 1836. The doings of the Poor Law Guardians in those days were not reported in the newspapers, but a circumstance occurred in bringing the first tenants to this workhouse, which invited the intervention of the journalist, a paragraph appearing in the local papers to the following effect: "A poor old man named Young, belonging to the parish of Ringwould, died while being removed from the River Workhouse to the new Union establishment in Buckland Bottom. On ascending the van in which the aged and infirm inmates were conveyed, Young did not seem to be unwell, but showed symptoms of drowsiness, which proved to be the stupor of dissolution, for on the arrival of the van at the Dover Workhouse, after the rest of the party had alighted, the driver tried to arouse him, when he was found to be quite dead.“ Thus poor Young, who, no doubt, in his day had enjoyed his pipe and his pot at the Five Bells at Ringwould, had no other use for Sir Francis Head’s grim hotel in Buckland Bottom than to make a temporary halt there in his progress to his final rest in the lap of Mother Earth. “Ale is stout and good, Whether in bottle it be or wood; Tis good at morning, ‘tis good at night; Ye should drink while the liquor is bubbling bright; ‘Tis good for man, for woman, and child; Being neither too strong, nor yet too mild." Thus began an appreciation of Mr Alfred Kingsford’s Buckland Brewery in the official South Eastern Railway Guide of 1863 from which the engraving above is taken. 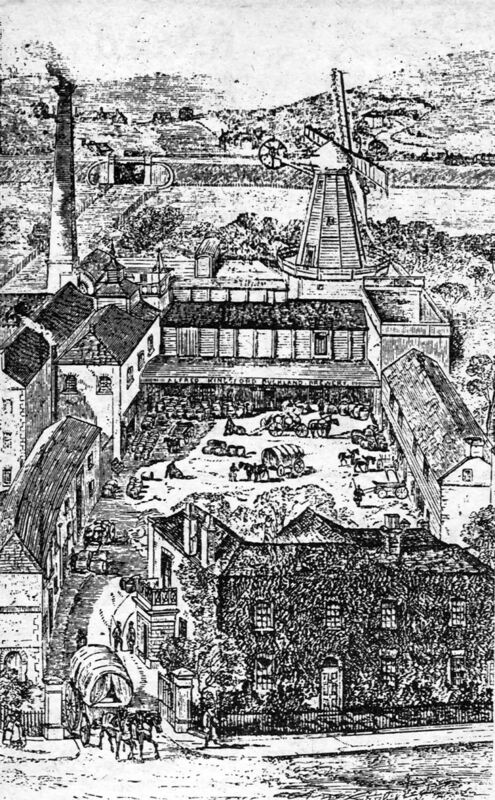 The brewery was renowned for its light pale bitter ales which doubtless owed a great deal to the quality of locally-grown hops, although a great deal was imported, the malt produced on site and the purity of the water raised by the windmill - operated pumps from a deep well. Relics which survive include part of one of the short sweeps and the stage from which the miller adjusted the shutters on the sweeps. They were preserved in the remains of the brewery buildings used today as a car body repair works. Beyond the mill in the engraving a train heads along an embankment towards the town centre. 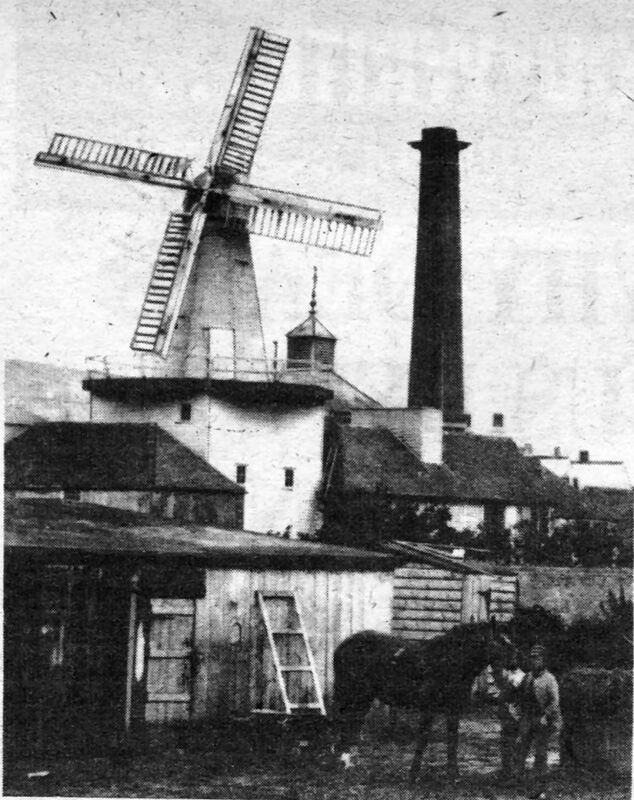 Not much is known about the windmill, which was also used in the processing of the malt used in making a variety of beers at the brewery, but there is a reference in an old newspaper to a new mill being built near the bottom of St Radigund’s Road, in April, 1798. The mill was reputedly demolished in 1863, but a local newspaper records that the Buckland Cornmill — which need not necessarily have been the same mill — was offered for sale for £2,200 in 1865 but failed to reach the reserve. The photograph above, believed to date from the 1890s before Magdala Road was built on land adjoining proves that the mill survived until much later. So far no evidence has been found as to when it was demolished.